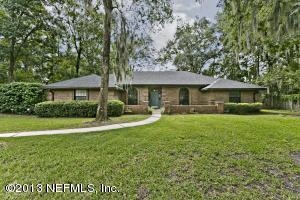 Description: Surrounded by lovely oaks on a corner cul-de-sac in beautiful Oak Creek, this 4 BR full brick home offers a tranquil setting in Fleming Island with NO CDD fees! You'll love the generous sized rooms with gorgeous crown molding, vaulted ceilings that add spaciousness, split floor plan, large kitchen with above/below cabinet lighting, wainscoting & a cheerful breakfast nook. Relax in a family room with a wood-burning fireplace, built in cabinets and double entry into a large screened lanai overlooking a serene & very private backyard. Master suite complete with huge walk-in closet, dual sinks, separate shower and large garden tub. Wood flooring & arched windows enhance the formal living and dining rooms side entry 2 car garage. New roof 2012 & Trane A/C 2011. Come be enchanted!